Everyone knows +Tom Tullis and Fat Dragon Games, right? Fat Dragon is known for its "Print at Home" paper terrain. It is THE company in that specific field of our hobby and is known for quality releases. Yesterday, Fat Dragon went live with DRAGONLOCK 2: Fantasy Village Terrain for 3D Printers. Yep, a Kickstarter campaign to supply the files for one to print your own gaming terrain at home, assuming you have access to a 3d printer. If you have access, it's by far the most economical manner in which to build up a limitless terrain collection. DRAGONLOCK 2 had a modest goal of $500 when it launched yesterday. As I type this it is at $41,000 with 34 days to go. 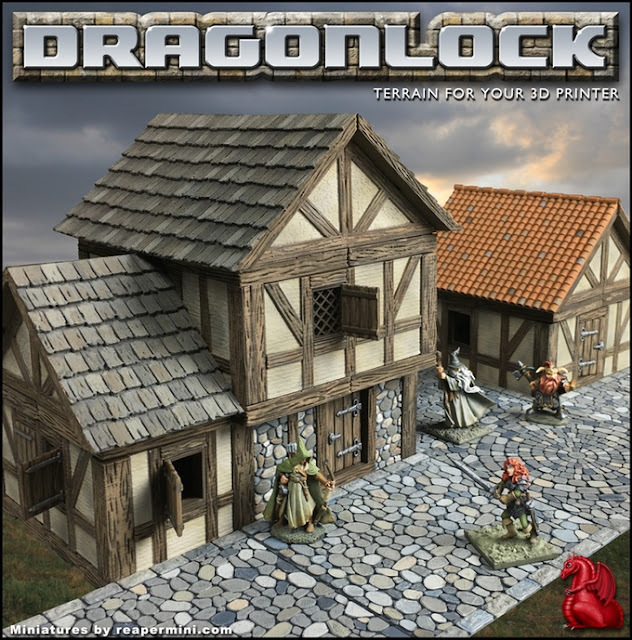 DRAGONLOCK™ (patent pending) is an all-new interlocking terrain system that allows you to create fully modular, multi-level 28mm scale village terrain for your RPG or wargame on your home 3D printer. Each set is delivered in a downloadable .stl format via our online distribution partner DriveThruRPG.com, and once you have the set, you can print as many pieces as you like and never run out or need to purchase more. This new terrain system is the culmination of eleven years of gaming terrain design experience. By supporting us through Kickstarter, you get bonus models that won't be available later, and access to free stretch rewards. We have been in the 'print-and-play' terrain business for over eleven years, and have successfully delivered seven previous Kickstarter projects, so you can pledge with confidence that we will deliver a high-quality product on time. I don't have a 3d printer, but this sorely tempts me. If I threw down anything, it'd be at the $75 level. Decisions..